Boronia schoolgirl Siriyakorn “Bung” Siriboon is still missing. 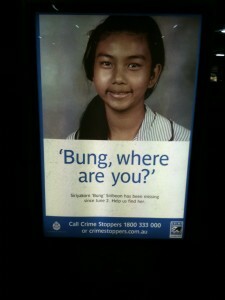 She disappeared on June 2 on her way to school. For more information on Bung’s case see Knox Leader, the newspaper that broke the story of the Boronia teen’s disappearance.